What kid doesn’t like playing with magnets? Magnet play is so appealing for kids. 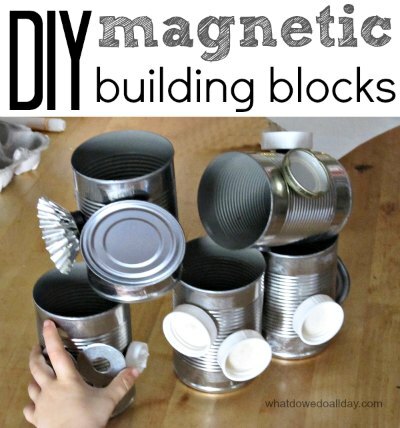 Reach into that recycling bin and get out your tin cans and bottle caps to make a set of magnetic building blocks for some creative construction play with your kids! I first saw this marvelous idea from Teach Preschool: A DIY Magnetic Play Kit. They made a really wonderful set using slinkys! I didn’t have any slinkys but we had fun just the same. Simply glue strong magnets to cans and a variety of lids. I used tacky glue (affiliate link) but if you have a hot glue gun that would work, too. I also put some magnets on the inside of the cans so metal objects like washers can “magically” stick to the outside of the cans. You can use peel off magnet strips, but they don’t stick very well to the curve of the can. Also my son loved swinging the cans around with his Telescoping Magnetic Wand (affiliate link)! Remember: ALWAYS supervise kids playing with magnets and never give them to children 3 and under or who are at risk of putting them in their mouths. That does look like fun! I <3 magnets. Very neat idea, especially if nobody in your house is paranoid about magnets being close to gazillion of electronic gadgets. Cute idea! I am your newest follower! I'd love for you to follow me back, if you want to. I'd also love for you to come link up at TGIF Linky Party – http://livinglifeintentionally.blogspot.com/search/label/Linkey%20Parties or enter to get one of my first ever guest posts that I'm offering up during the month of December. This idea is adorable. I love Teach Preschool too! I'm a new follower and I'd love for you to stop by and share this (or another great activity) at my new Thrifty Thursday Linky Party this Thursday! This is such a cool idea! Thanks for sharing it. I love this idea, and I think the hooligans would love it too! Pinning this one, and adding it to our to-do list. What do you do about the sharp edges on the cans? We have a can opener that works horizontally so there is no sharp edge. But you could also sand down a sharp edge or cover it with duct tape.